Boca Towers is a luxury condominium community offering one of the best values in waterfront condominium living in Boca Raton, FL. Also one of the few Boca Raton condo communities that allow pets near the oceanfront, this pet-friendly, affordable waterfront condo complex consists of attached seventeen-story East and West buildings with a total of 272 beautiful units. Condos in Boca Towers offer amazing views of the Atlantic Ocean, Intracoastal Waterway, and downtown Boca Raton, and range from 700 to 1,900 square feet of living space with one- to three-bedroom floor plans. Many of the condos for sale in Boca Towers have been completely remodeled and updated to include many highly desirable interior features. These luxury condos feature spacious walk-in closets, granite countertops in the bathrooms and kitchens, open layouts, as well as private balconies with stunning views of the surrounding water and lush landscaping. Each unit in Boca Towers also comes with a designated parking space in a covered area with direct access to the lobby elevators. Originally built in 1972, Boca Towers recently completed extensive renovations to the entire complex. Renovations included remodeling of the common areas and lobby, new fitness room, elevators, plumbing systems, and the installation of a state-of-the-art security system which includes secure gated access, 24-hour surveillance, doorman, security patrol, and private guard. Boca Towers offers its residents several high-end amenities which can be enjoyed year round. Amenities include private deeded beach access, a fully equipped gym, saunas, game rooms, shuffleboard, community kitchen, and a waterfront patio area complete with two gas grills and tables for outdoor dining. There is also a newly updated large heated pool with a luxurious pool deck, shaded picnic areas, and community docks on the Intracoastal Waterway. Boca Towers condominiums also offer residents the convenience of having laundry rooms situated on each floor. Living in Boca Towers, residents only have to stroll across the street to enjoy the warm beaches of Boca Raton. Boca Towers is convenient to many of the beautiful community parks in Boca Raton which include the Gumbo Limbo Nature Center, James A. Rutherford Park, and Lake Wyman Park. Boca Towers is also near some of the area's finest shopping centers, restaurants, and entertainment venues, including Mizner Park, one of Boca's most popular destinations. Boca Towers is an affordable, yet luxurious and peaceful community to consider when looking to purchase a condo in Boca Raton, FL. 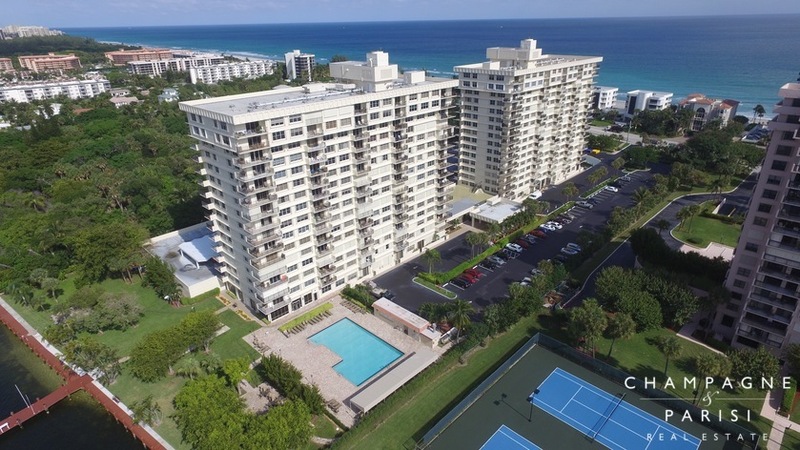 If you are interested in Boca Towers, you may also want to visit San Remo Club and Sea Ranch Club of Boca, both of which also offer more affordable luxury condominium living with excellent views in Boca Raton, FL. If you would like to learn more about Boca Towers or any of the other waterfront condominium communities in Boca Raton, please call us at 561-998-9015. You may also reach us by completing our simple online contact form provided below. We at Champagne & Parisi Real Estate would be delighted to assist you in finding your next dream condo in Boca Raton, FL.